The Unnatural Museum - Experiment with an "After-image." For many years scientists were skeptical that such a strange phenomenon as ball lightning, (a hissing, glowing sphere a few inches in diameter, sometimes seen after a regular lightning strike) even existed. Some theorized that the ball was only an optical illusion in the viewer's eyes. A so-called "after-image" caused by the brilliance of the regular lightning strike. 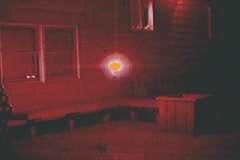 Scientists are beginning to believe in ball lightning as a real physical effect now. Still, our eyes do hold after-images when we see something. When we see a bright flash it "stuns" the cells at the back of our eyes that transmit the image to our brain. For that reason the cells may continue signaling the brain that they see light even after the actual flash has disappeared. As those cells go back to normal they are "tired" from transmitting and their signal will be weaker for a while than the other cells not affected by the flash. For this reason the after-image will turn from being bright to being dark in a few seconds. You can see an after image even without a flash. Since different cells at the back of our eye detect different colors, we can generate a color after-image. STEP 1: Look at the diagram below and stare at the red ball in the right hand section while you count to forty. STEP 2: Shift your eyes to the left-hand section. STEP 3: Notice that you can see a blue/green tinted ball on a purple tinted background. While looking at the red ball on the green background your cells responsible for signaling the brain about those colors got tired. When you shifted to the white section those cells couldn't produce a strong a signal as the others. White, which is the sum of all colors, minus the green signal, looks purple. White, minus the red signal, looks blue/green.